Capn Skyp's published some of my "lunatic fringe" stuff on his website! I feel it entirely appropriate that I begin the Forbes Purchase project on this first birthday of my blog. My work now has the hefty title of An Annotated Bibliography of Documents Related To The Grand Strategy of John Forbes & Co. To Collect The Debt of The Southeastern Indian Tribes. James Doster, The Creek Indians and Their Florida Lands (New York, 1974),p. 249- 251. This extensive, two volume report [Petitioners' Exhibit 400] from Indian Claims Commission Docket 280 was prepared by James F. Doster, Professor of History at the University of Alabama. 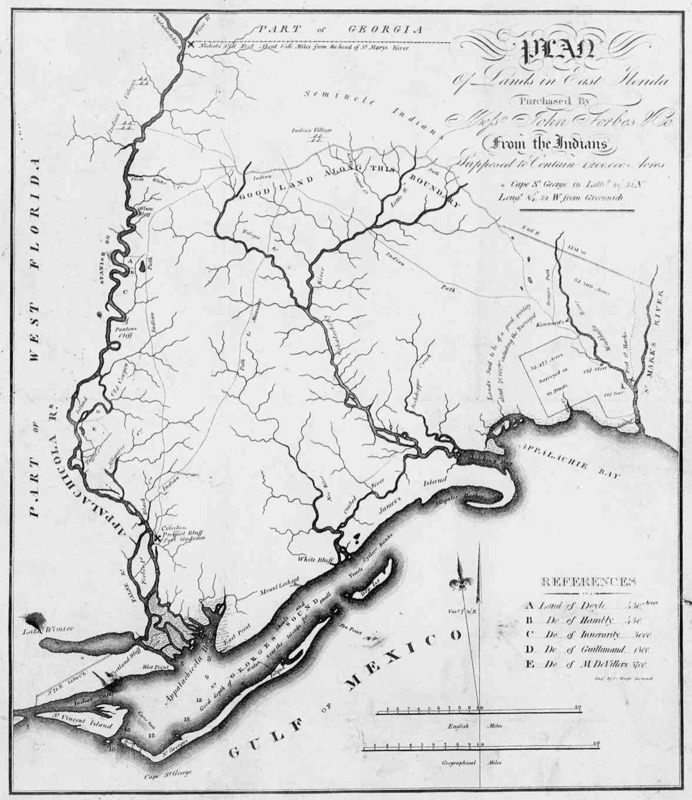 This lengthy report was written to counter claims that the Seminoles should be considered as a separate tribe from the Creeks. A key portion of this argument that "Seminole" and "Creek" are interchangable terms received special treatment in an appendix Dr. Doster placed in his report to the Indian Claims Commission. This 21 page appendix deals with how the Forbes Purchase of May, 1804 fit into the John Forbes & Co. strategy to secure payment of the large Creek Indian debt due their business. Pages 249, 250 and 251 deal with the conference Indians held with representatives of John Forbes & Co. at Chiskatalofa which resulted in the cession of Indian land known to this day as the Forbes Purchase. This index and digest of exhibits was compiled by Jim Tiger. It is hoped that the occasion of the 200th anniversary of the Forbes Purchase at Chiskatalofa on May 25, 2004, will focus attention upon Dr. Doster's important work and result in its proper publication including the appropriate illustrations and corrections. The authorized publication of James F. Doster's Creek Indians and Their Florida Lands will also be an excellent opportunity to commemorate the life and impassioned leadership of Calvin W. McGee, the first chairman of the Tribal Council of the Poarch Band of Creeks. After all, Dr. Doster's Petitioners' Exhibit 400 was prepared and submitted in the case of Indian Claims Commission Docket 280: C.W. MCGHEE, ET,AL.,Petitioners vs. THE UNITED STATES OF AMERICA, Defendant. Jim,please feel free to make any suggestions and please feel free to forward this first installment of the Forbes Purchase bibliography to anyone. READ THIS IF YOU WANT TO SEE HOW GOVERNMENT IS OUT TO RUIN OUR LIVES!! Hey, long time. Don't believe everything you read. I've discovered Carolyn has "selective memories." She was just here from London for 3 weeks over the holidaze and we had a rockin' good time. Between her, my girlfriend and sister I could barely get a word in edgewise. I'm still surrounded by women. Could be worse, I guess. I'll check out Babbs' site. Roll Tide! Ok, keep in touch, and let me know if that web site gets off the ground. the river? I think I remember your house, if it's the party I'm thinking of. lot of crazy people there that night--I felt right at home. where we used to go to get some sleep in the wee hours. Marx Brothers, W.C.
pretty invincible at that age. I can't party like that anymore. "One flew East, one flew West, and one flew over the cuckoo's nest." 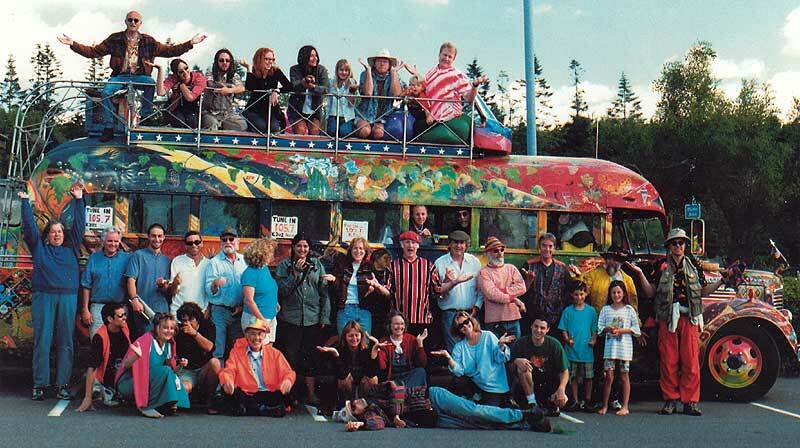 The long, strange trip came to an end for Ken Elton Kesey at 3:45 AM Saturday, November 10th, 2001, after 66 years and a few hundred lifetimes on this planet. Ken was a great friend to my father, Neal Cassady, and almost a second father to me after Neal died in 1968 when I was 16 years old. Kesey was one of the kindest and wisest men I've ever known, and he was one of my biggest heroes and mentors starting soon after he met Neal in the early '60s, a feeling which continues in me to this day. The pearls of wisdom that he shared with me and others around him are too numerous to count, but thankfully he left a great legacy in his body of work that will last forever. Neal always wanted to be a provider to his family, and little did he know that much of that provision would be accomplished posthumously through doors that were opened to me because of his famous friends like Kesey and the Grateful Dead, Jerry Garcia being another of my heroes from about 1965 on. Much to the worry of my mother, Kesey and Neal would come collect my sister and me at high school, giving the authorities some song and dance about dentist appointments or whatever, and they'd whisk us away to see the Dead play at some local high school prom dance, just after they changed their name from the Warlocks. Some fond, early memories there. I recall once being called to the school office, not knowing what I had done to deserve what was surely going to be trouble from the evil principle, only to open the door and see Neal and Ken dressed in American flag jumpsuits complete with day-glo red Beatle boots and silly hats. The principle looked confused and said to me "this man claims to be your father!" He looked like he thought the circus was in town. My mother needn't have worried. When I'd try to sniff the smoke from the refers being passed around the car, Dad would admonish the passengers "no dope for the kid!" Kesey knew I was disappointed, but always honored Neal's request in those early days. After Neal's death Kesey would go out of his way to look us up when he was in the Bay Area, and he showed up unannounced at my wedding in November of 1975 on his way back from Egypt, while writing a piece for Rolling Stone. That was one heck of a party. I still have pictures of him holding my then-3-month-old son, Jamie, and beaming like a proud godfather. Another warm memory was back stage at a Dead show in Eugene when Kesey's fellow prankster Zonker ceremoniously presented me with one of 2 railroad spikes that the Dead's roadie Ramrod, while on a sacred pilgrimage, had extracted from the tracks where Neal died in Mexico. And again when Kesey and Ken Babbs bequeathed Neal's black and white stripped shirt to me that he had worn on the bus trip to New York in 1964, this time during a show we did at the Fillmore in 1997 before bringing the bus to Cleveland, where it was inducted into the Rock and Roll Hall of Fame. Ken called and asked if I would drive "Further" into Ohio "because Neal can't make it this trip." 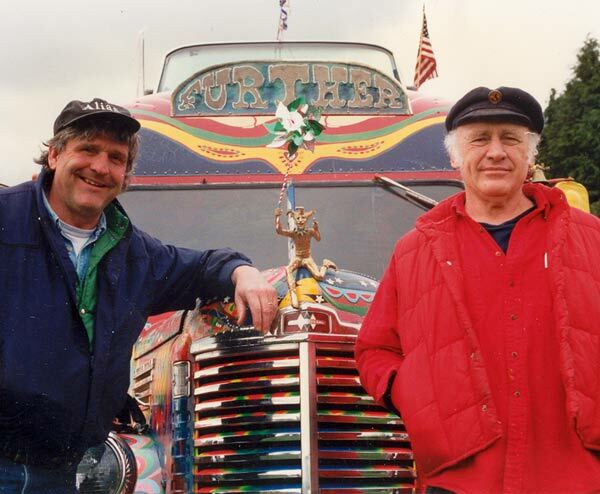 Although veteran Prankster driver and mechanic George Walker did the actual driving, Kesey's heart was in the right place. That road trip was surpassed only by the 4-week tour of the UK in 1999, sponsored by London's Channel Four studios. Traveling with Ken in close quarters for that long really made for a lasting bond between us, and he was at his peak as a performer. It was fun for me to play guitar behind his harmonica and the Thunder Machine. I last saw him as we said our goodbyes at SFO after that incredible journey, and I was sad to have not been able to do so again before last Saturday.